I have a 4K Monitor connected to my Mac Pro. However, since 4K on 28" is a bit too small for my taste, I prefer to make use of OS X's scaling options and run a 2560x1440 resolution. As OS X is vector based internally, it is capable of pretending to run in that resolution but still output a native 4K image to my monitor - in other words, the output should be razor sharp and crisp. 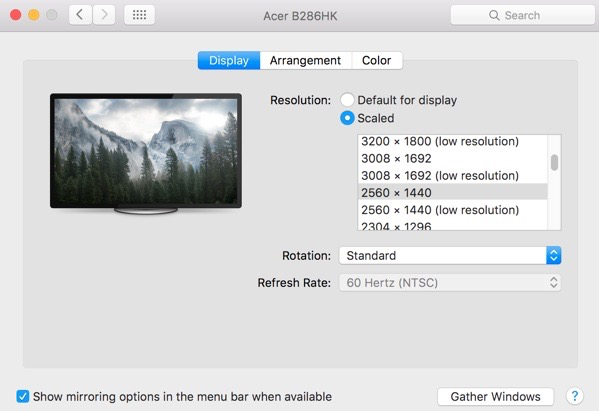 However, when I looked at the options (System Preferences > Displays > Scaled), I noticed that all the non-native options were marked as (low resolution) and when selected, text looked blurry. The trick is to hold down Option (Or "Alt" on non-Mac keyboards) and click scaled - this will unlock additional resolutions, including a 2560x1440 without the (low resolution) suffix that looks as it should be - crisp. I don't know why these don't show up by default - I have a third-party graphics card (Geforce GT 640 from MacVidCards instead of the original, non-4K supporting Radeon 5770) and a third party monitor (Acer B286HK).